Q1. 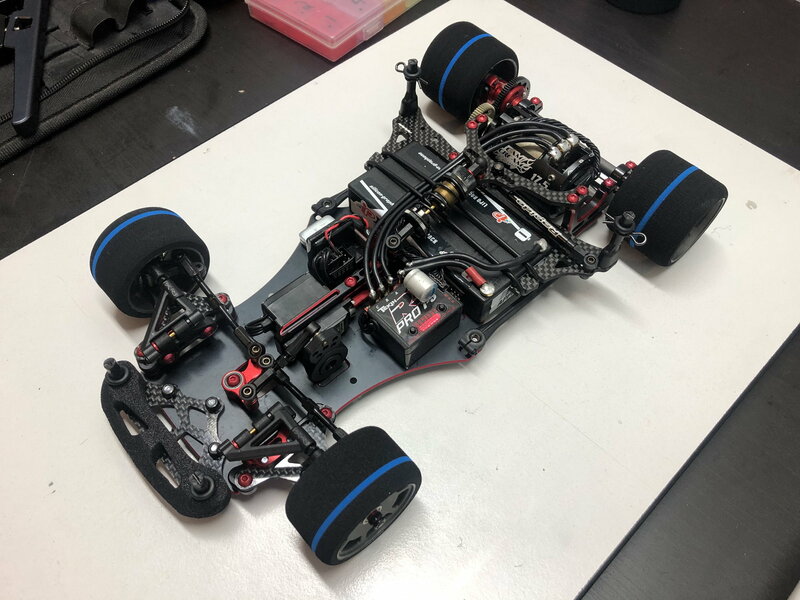 Will the P12 Evo support a traditional style steering servo setup? A1. Yes. The chassis supports this, but parts are not included. Q2. Will the P12 Evo support prior Roche P12 front ends featuring a Xenon lower arm? Q3. What is the maximum size servo width that can be used on the P12 Evo? Q4. 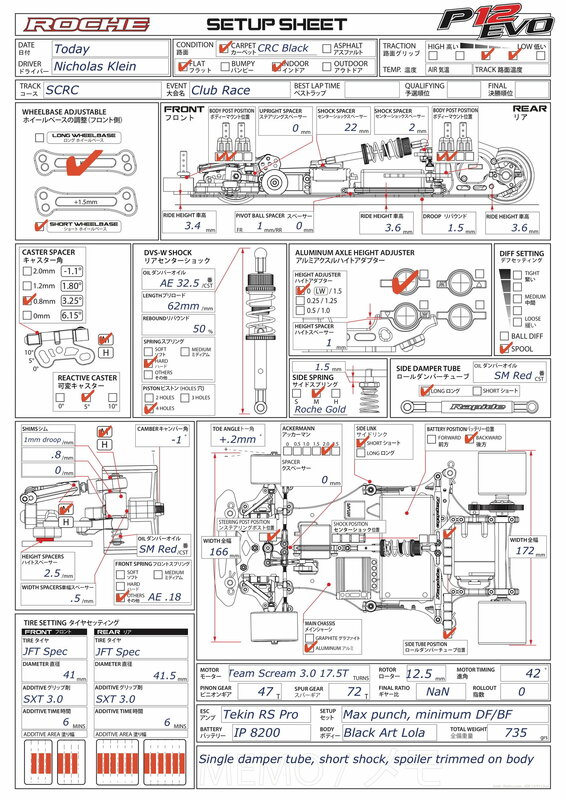 Which servos fit into the P12 Evo? Drop a 22mm post in that vacant hole between the cube and the battery retainer. Remove the extender from the shock. Reduce your droop from 2mm to 1.25 if you're on a smooth track. Move your ackerman to 1.0 or 1.5. Try either Roche white front springs or AE 18 as the Xenon's are a short throw spring. Make your front droop 1.0mm. CRC 45 sides are waaayyy toooo soft, go to Roche White or yellow "touching" if your grip will allow it. Switch to long rear wheelbase, rotates more. When you do all that, you may find you do not want that camber gain for stock. You may want no shims above the steering block and all on top of the eyelet. Yes, you can get the car to carve hard, but you'll scrub the speed at entry too much with a spool. I don't know what SM Red is for tube lube, but if it's close to 15-20k, you should be in the ball park. Keep going stiffer on tube lube until it starts lifting the inside tire, then back down some. Any issues with the chassis not being perfectly flat? A guy I race with has had 5 or 6 Roche cars and even brand new every aluminum chassis he has got has been warped a bit. Track is very smooth with medium grip on most days. I'll switch over to the even shorter shock setup with 1.25mm of droop and long wheelbase. I have some AE.18 front springs I'll try. For side springs I have CRC .50, and Roche Gold Mediums on hand. Nope. I've built 3 since xmas, all have been the finest 12's I've ever built. trilerian and AngryRog like this. Running 1 tube is no different feeling then 2 tubes. It's easy to over think it's effect. The reason 1 tube is used is because its common to run 10k or 15k with a spool on black. With dampening that light, in order to get the same effect in 2 tubes, you'd run 5-7K. It runs out of the tube causing it to be rebuilt more frequently. So....1 tube, twice the oil weight, half the work, same effect. If 5+ chassis are warped I would start to question the "flat" surface. I'd suggest testing on glass. I bought a Roche P12 Evo US Spec from a guy on here last night. I am going to piece together a ball diff to have as an option to the spool and I have never used a Slapmaster thrust bearing before, so I'm not sure which kit I need for the Roche. Also, I am assuming that I won't need the to order the stock cone spacer or the belleville washes either, is that correct? Cone no but the Belleville washers while not required give a bigger range of adjustment for the diff when using the Slapmaster kit. dway100 and LonnyJ1950 like this. If you hit stuff, use a servo saver. If you're a pro and get free servo's, don't use a servo saver. dway100, hanulec and LonnyJ1950 like this. Did you compensate for the rim offset? I had to shim the rear axle out to get to 172mm then use an unflanged bearing on the outside of the front rims and add more shim to the axles. Thanks for the help Slapmaster6000 and sg1. Attached my starting setup for tomorrow. I mistakenly ordered a Xpert MM-3301 servo rather than the MI-3301. However, the dimensions are identical, and since Brian has shown the MI-3301 fits perfectly, I thought I would be ok. I went to assemble the servo mount tonite, and while the servo mount will fit over the servo (in the longer configuration), the servo mounting holes do not line up (too close to the servo body) to the floating mount holes, and even if the holes did line up the ears of the servo interfere with the steering rack - it's simply too big. From inside to inside of the mounting holes on the servo mount, I get 36.1mm, and on the servo 38.6mm. Not even close. Are the mounting holes on the MI-3301 closer to the servo body? I do have a couple Airtronics servos that are on my CRC CK25's, but they look to be too small, lol. The other issue I'm having is that the o-ring on the shock retainer simply won't fit - it's too big (circumference). I've tried everything I know, including cooling the o-ring down to get it to shrink a bit, and no dice. It won't fit. Anyone else run into this issue? Bit annoyed right now - I was hoping to have the build done tonite, but I don't think it's happening. So, I think I've answered that question. I'll have to get the MI version. Still have the o-ring issue tho. All times are GMT -7. It is currently 07:28 AM.